The winners of the 2018/19 School Travel Awards have been revealed at a celebratory ceremony held in Kensington, London. BBC TV news anchor and Antiques Roadshow presenter Fiona Bruce hosted the UK’s biggest event for school travel and learning outside the classroom on Friday 16th November at the Royal Garden Hotel. 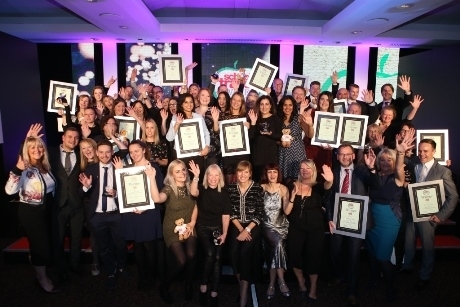 The School Travel Awards, organised by School Travel Organiser magazine, recognise how important it is to reward those in the education sector, especially those who excel in providing exciting and educational trips for Primary and Secondary schools. Amongst the winners announced was the World Rugby Museum at Twickenham, voted Best Sporting Venue, the V&A London, which picked up the award for Best Museum Visit, while Cheddar Gorge & Caves in Somerset won Best Venue for History Learning. Two of the awards recognised best practice within schools and each come with a £1,500 prize to spend on a school trip. Moorside Primary School in Lancaster was revealed as the winner of this year’s ‘My Best School Trip’ Award. Teacher Jonathan Whitwell entered the Year 1 residential trip to the Malham Tarn Field Studies Centre in the Yorkshire Dales. He asked the children to write about their experiences of the residential to the centre and provided his own commentary on what impact the trip had on them. The judging panel for the award consisted of Kim Somerville, chief executive of the Council for Learning Outside the Classroom, Gill Harvey, CEO of School Travel Forum, Peter Carne, OBE, Learning Away National Adviser, Rob Yandell, publisher of School Travel Organiser and Keeley Rodgers, editor of School Travel Organiser. The final accolade of the afternoon went to Alan Butters, enrichment coordinator at Bluecoat Beechdale Academy, Nottingham, who was presented with the School Trip Champion Award. The award is designed to acknowledge the hard work of an individual who goes the extra mile when it comes to getting children learning away from the classroom. Editor of School Travel Organiser magazine, Keeley Rodgers said: “Without our readers voting, and our fantastic partners, none of this would be possible. Around 300 guests including teachers, educational visit coordinators and school travel experts joined Fiona at the special lunch and ceremony. A surprise performance by a member of the Matilda the Musical cast, from London’s West End, opened the ceremony after a themed drinks reception, sponsored by The London Bridge Experience & London Tombs. The event not only provides a platform to recognise the people and companies within the sector, but enables a range of people to meet and network while celebrating the best in learning outside the classroom. You can always read the latest edition of School Travel Organiser at schooltravelorganiser.com/magazine. To register for a magazine subscription or the regular newsletter click here. For more information about the School Travel Awards visit www.schooltravelorganiser.com/awards.